How to delete your Skype login data in a public computer? a curious place, modern creation that’s called cyberspace. Like Pookie, and Sandman and Rosebud and Flames. Some are just snobs and some are real fun. And some of them just want to find someone. But both good and bad they all play a role. Still each one unique, but part of the whole. We talk and laugh and wonder why. We can’t be heard and can’t be seen. Yet, there it is, right on our screen. Is the power it has to open our heart. Which to our closest of friends we’d never reveal. The scars in our life which bring us to tears. and show me the truths that I never see. And make me confess the deceit and the lies. But I know that without it my life would be hell. Cause there’s no place on Earth where you’ll find as much love. those angels from Heaven just waiting on-line. FarmVille Freak Thorsten has earned the Gold Reward for all currently available Co-Op Jobs! Congrats Thorsten. Here is a picture of his Gold Reward prizes for completing all eight jobs. Note, when completing a Co-Op Farming job, you will only receive the special prize Reward for earning a Gold status. 1: Display the image which you wish to capture. 2: Press the Print Screen key (abbreviated as “PrtSC” or “PrntScrn” which is usually accompanied by “SysRq”) when you are ready to capture a screen. It automatically stores the image in the Clipboard. 3: Open Paint, PowerPoint or any program which can open a Bitmap file (.bmp). 4: Press Ctrl+V (or click “Paste” under “Edit” in the Menu bar). 5: Save the newly created image file. You may save it as *.tif, *tiff, *.gif , *.jpg, *.jpe or *.jpeg (commonly accepted on Facebook, Friendster and Myspace). (Note: Paint and PowerPoint actually produce poor image quality so I used Adobe Photoshop Elements 7. Open this program before capturing the screen. Click “File”, then “New” and choose “Image from Clipboard” instead of “Blank File”. Don’t forget to save it. This is what i have just created using Adobe Photoshop Elements 7 with a single click enhancement. The image reveals my current status (lol). If you’ve noticed, I have 44 items in my gift box. I thought I could have up to a thousand of gifts as long as they come from your Facebook friends’ posts (through filtering – http://www.facebook.com/home.php?filter=app_102452128776) but I found out that gift limit was raised from 30 to 50 items. You have to use/sell ’em before opening gift requests, though. I joined Facebook in 2006 with only about 5 friends . I eventually forgot to visit my account for there was not much to do. Until one of my closest friends invited me in July 2009, I decided to create another account. I wasn’t enthusiastic about Facebook until I accepted game invitations. I first played VampireWars but I unexpectedly enjoyed FarmVille more. Since then, I stopped blogging and spent most of my time, some precious and supposed-to-be-productive time, clicking and maneuvering my mouse. My goal was to get a villa so I kept playing to reach Level 34. I wanted to stop playing but I can’t help myself. New features keep on coming and I’m always tempted to try them. What really made it hard for me to abandon my farm were the Christmas Seasons items and free Fuel Refills. 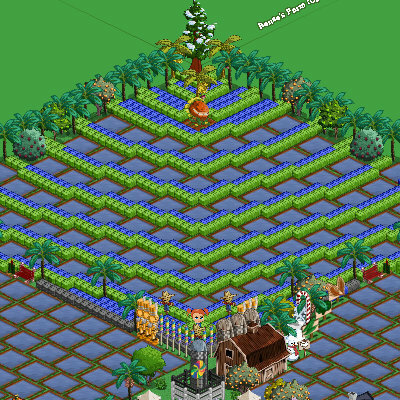 I was also inspired to design my farm when I found out about FarmVille Art. It took me a couple of months to enjoy it. I was thinking about mastering all the crops but I know this is too much to dream of. I may be going nowhere in playing FarmVille but I guess this is better than playing offline games. At least, Facebook games allow its users to have some social interactions where they help and support each other. It’s just like keeping a long distance relationships and it isn’t bad at all. Some games may allow stealing but it’s not that offensive and it doesn’t violate human rights or ethical principles. I believe, the game designers don’t wish to promote such a bad habit into real life. They only wanted to provide an option for those who are hopeless. Now, it’s up to the players if they choose to be more patient, work harder, develop better skills and think wiser or become little wretches. My Little FarmVilleIs Facebook Lowering your GPA? Are You Suffering from Facebook Addiction Disorder (FAD)?Are You A Facebook Addict? I’m absolutely certain that I’m not a Facebook addict because there’s only one item (#4) that I assert to be true. Writing on this blog is a good sign that I have control over my time. I thank God for all His blessings — for giving me a chance to live and wisdom on how to live life.